You cannot use this tool to inspect code from Microsoft Outlook or Microsoft Access. However, you can use the tool to inspect Excel, PowerPoint, and Word code for interaction with the Outlook object model. 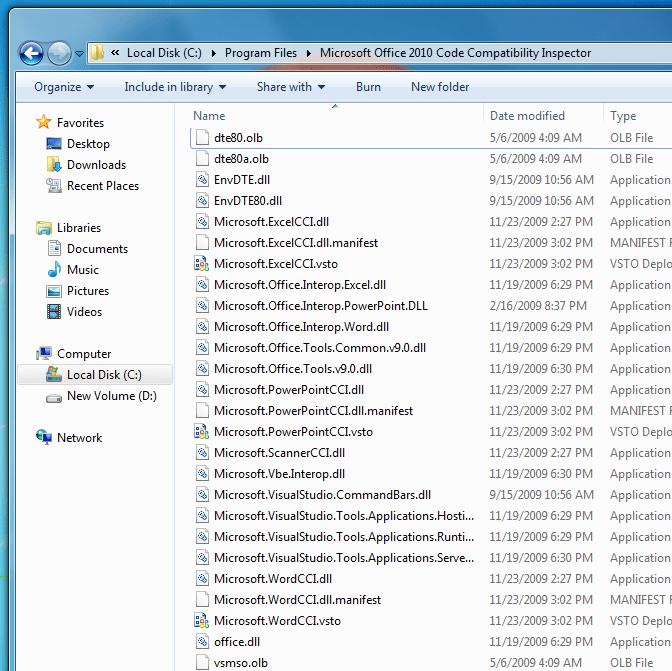 This tool checks Compatibility for code written for the older Office applications (Office 97, 2000, XP, 2003 and 2007) for use with Microsoft Office 2010. 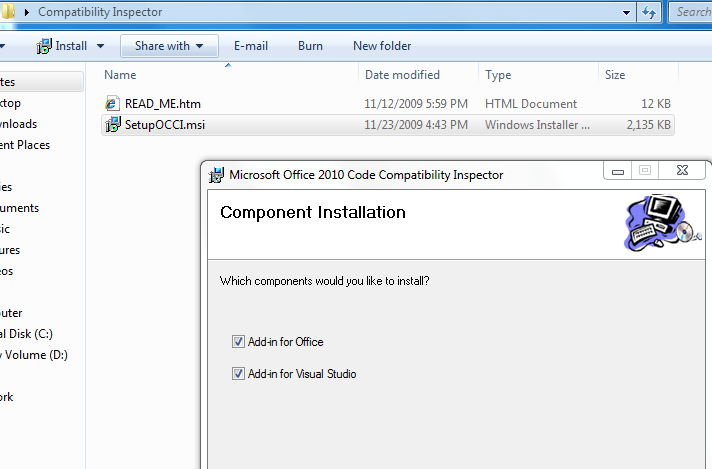 Download the Office 2010 Tool: Compatibility Inspector to begin with! Double click the exe, it will show you a path where you will need to extract the installer. Once done, you will have a msi file. While Installing this msi file, you will get an option to select the addins which you want to install. To invoke this tool, launch any office application. For example, I will start the Microsoft Excel. Once you do so, you will get an addin installation dialog. Surprisingly, the addins gives an unknown publisher for an inhouse Microsoft Tool. You will need to enable this addin, so that it appears in the Ribbon menu control. For doing so, goto File Menu->Options-> Customize Ribbon. You will see that the Developer checkbox is un-checked. Select the checkbox (as shown in the below snapshot). Once this is done, you will see a new Developer Menu appearing in the Ribbon controls. Now you can inspect your VBA project for Office 2010 Compatibility. You can select these options (as shown in the screenshot below) while running your code inspection. This tool checks compatibility for code written for the legacy Office applications (Office 97, 2000, XP, 2003 and 2007) for use with Microsoft Office 2010. At the end of the inspection, you will get a summary report on the scanned, depecated, changed and redesigned items. You can also inspect a Visual Studio Code for its compatibility, All you need to do is., to enable the addin, Open the solution that you want to inspect in Visual Studio Tools for Office, On the Tools menu, click on Inspect VSTO code. If the Inspector finds Changed, Deprecated, or Redesigned items in your code, you must debug your code and resolve any issues. As you debug your code, check for Office Code Compatibility Inspector comments above the lines that break your code. Those comments should help you to determine the underlying problem with that particular line of code. I would also recommend you download and use the Assesment Tool (OEAT) to assess your machine for Office 2010 installation and Addin Compatibility. Posted in How-to, Microsoft, Tools and tagged howto, Microsoft, office, Softwares, Tools. Bookmark the permalink. Excellent blog post. In fact, the words should be spread for the same. Thanks Pinal. I am glad that, you liked the articles! This looks like a pretty useful tool. Do you know if there are similar tools for Access 2007?